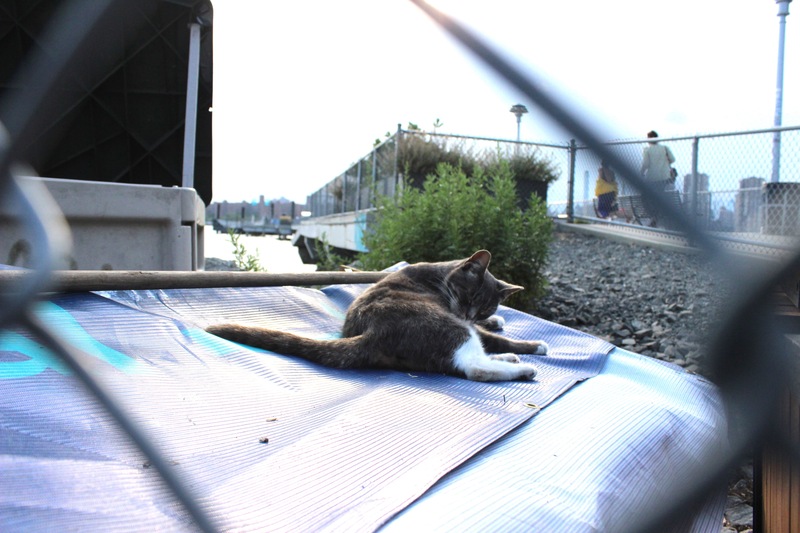 Angela Velasquez is hoping Greenpoint's threatened feral cats might find a permanent home in Bushwick Inlet Park. GREENPOINT — They're hoping for a purrfect home. 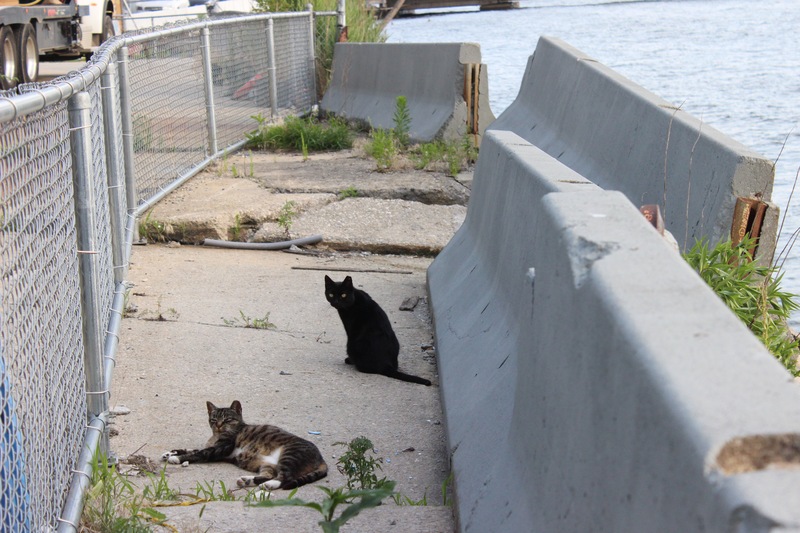 Feral cat caretakers, concerned about the felines' futures along the Greenpoint waterfront in an area increasingly torn up by the waterfront construction boom, hope the furry critters get a permanent home by turning Bushwick Inlet Park into a feral cat sanctuary. 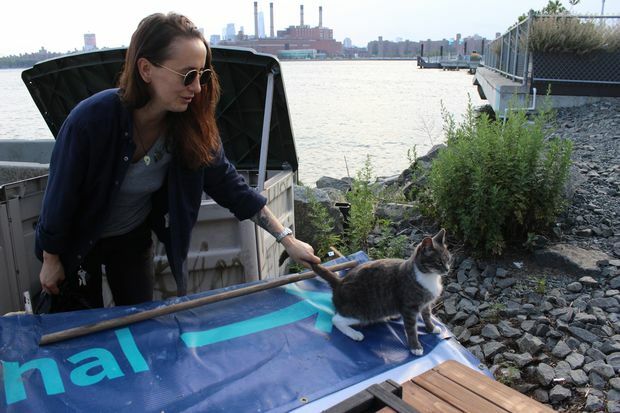 Angela Velasquez, 36, a Greenpoint resident, has been helping care for a feral cat colony beside the India Street pier, owned by developer RedSky Capital. The builder has plans to turn the lot into a 40-story apartment tower condo, so the cats could get kicked out at any moment. "Any day now we could come here and this could all be trash," Velasquez said, gesturing to the hodgepodge row of cat shelters built by local residents. "We have no idea." The feral cat caretakers, a group of about ten dedicated Greenpoint residents with an elaborate feeding schedule in place, already had to move the current cat colony last year from its location on the north side of the pier when construction workers at a 40-story tower across India Street, the neighborhood's first of many forthcoming skyscrapers, usurped the tiny plot of land the cats lived on for years. Now, about eight feral felines are crammed into a 10 by 15 foot triangle of gravel and pavement by the East River. Tenants of RedSky's industrial building at 131 West St. are leaving at the end of the month, a worker there confirmed, and with the building empty it's only a matter of time before the company moves to demolish the structure. 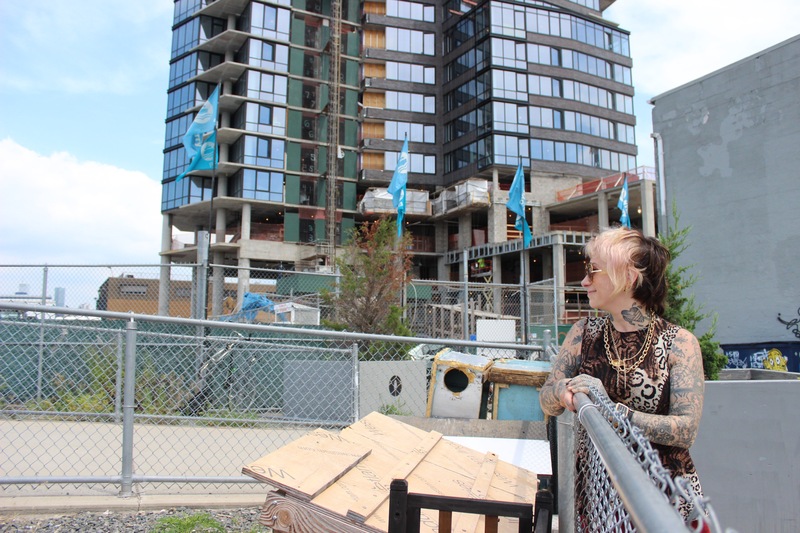 There are no building permits on file for the property and RedSky, which owns India Street Pier, didn't return a request for comment about the cats or plans for the building. Velasquez and her crew can keep rounding up the cats every few months resettling them in some unclaimed territory nearby, but she hopes Bushwick Inlet Park might provide a more permanent home for the felines, all of which have been spayed and neutered. Because they were raised on the streets, they can't be adopted, she said. She's pitched a plan to create a cat sanctuary to Friends of Bushwick Inlet Park, arguing that it would attract tourists, control rodent populations and make it easier to contain feral cat populations by having a central location to trap and neuter them in the future. It could also provide a home for other feral cat colonies in the neighborhood facing displacement because of construction. Velasquez points out cat sanctuaries in European cities such as Rome, where feral cats inhabit a historic ruin, could be used as a model. The sanctuary would be staffed by volunteers and funded from money garnered from collecting and recycling cans and bottles thrown away in the park, Velasquez said. Steve Chesler, who heads up the Friends group, said the plans for that park are still in the very preliminary stage, and he said was concerned about the impact the cats would have on bird populations who might attempt to make homes in the park. A spokeswoman for the Parks Department didn't return a request for comment immediately. The city's construction boom is already threatening feral cat colonies in Hell's Kitchen and Long Island City to Carroll Gardens.